FILE - Pakistani Naginah Sadiq, 5, who works in a brick factory, rests on a bed next to her sister Shahzadi, 8 months, sleeping in a hammock attached to the bed, on the outskirts of Islamabad, Pakistan, June 12, 2012. An international court should be set up to punish those responsible for child labor and other forms of abuse against children, former British Prime Minister Gordon Brown told the United Nations on Monday. A court to investigate cases of child labor, child slavery and child marriage is urgently needed amid the current refugee crisis, Brown said at a media briefing ahead of a meeting with U.N. Secretary-General Ban Ki-moon. The proposed children's court was among several recommendations Brown brought to the U.N. as head of the Global Citizenship Commission, a group of political leaders and academics focused on human rights. Such a court would have the power to oversee cases requested by children and issue legally binding rulings, the group said in a lengthy report. 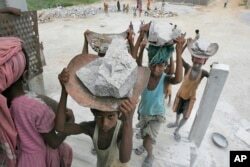 FILE - Child laborers carry stones on their head at a stone crusher on the outskirts of Gauhati, India, June 11, 2008. "We need, in a sense, a civil rights struggle by and on behalf of children because their rights have been neglected in the international community," Brown said. Children account for half of the world's displaced people, he said. Some 168 million children — one in 10 globally — can be classified as child laborers, according to the International Labor Organization. The children's court would be similar to the International Criminal Court, based in The Hague in the Netherlands, that hears cases of genocide, war crimes and crimes against humanity. Last week, the U.N. Children's Fund (UNICEF) called for child refugees in Europe to be better protected from traffickers. "When so many children are displaced, the first priority has to be to ensure that children's rights are protected," Brown said. A million migrants, many fleeing Syria, Iraq, Afghanistan and other nations in conflict in the Middle East, Asia and Africa, have poured into Europe through Greece since last year. The Global Citizenship Commission includes such members as Nobel Peace Prize winner Mohamed ElBaradei and Klaus Schwab, founder of the World Economic Forum. The group also recommended revisions to the veto process among nations that are permanent U.N. Security Council members and reform of the way U.N. refugee aid is funded.